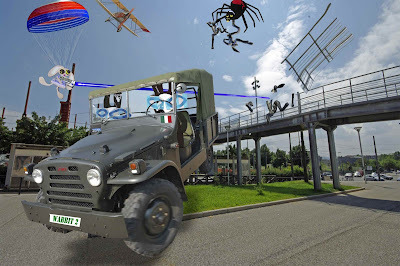 The Wabbit suddenly twisted the steering wheel and the jeep smashed through the Hopway railings. Everything went quiet as they sailed through the air. "Is this wise Commander?" asked Wabsworth. "Wabbits gotta have fun!" shouted the Wabbit. His ears twitched as he heard snaser fire. "Brace yourself!" he yelled. Wabsworth grabbed the dashboard. All of his 28 teeth chattered as the jeep landed with a suspension sapping smash and swerved across the breadth of the road. "This is a fine vehicle," stuttered Wabsworth. "Quite old fashioned," smiled the Wabbit. "I suppose you want one." "I'd like some proper upholstery," said Wabsworth, rubbing his fur. The Wabbit chortled. "How are our reinforcements?" he asked. "Making short work of the enemy," said Wabsworth. "We'll never hear the end of it," murmured the Wabbit, "so let's pretend it wasn't really us." "I don't think that will work," said Wabsworth. "Of course it won't work," replied the Wabbit, "but we can wind them up trying." "Yes, we'll let it drop casually," nodded Wabsworth. "OK, let's practice," said the Wabbit, adopting a conversational tone. "I was just displaying my golden wabbits, when a funny thing happened." "How will we explain the damage?" asked Wabsworth. "It was like that when we got here," grinned the Wabbit.